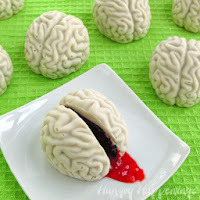 Serve some Bleeding Brain cake balls at your Halloween party. 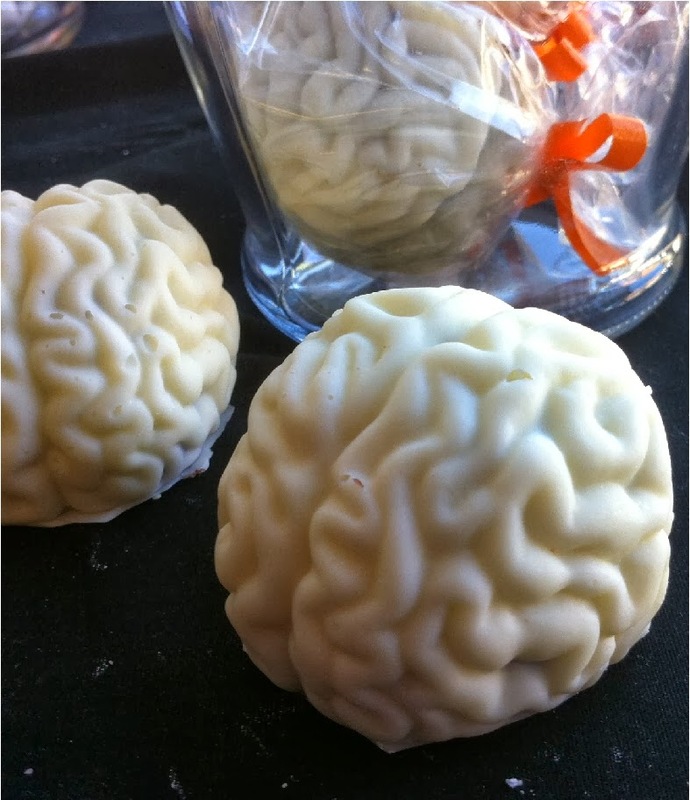 Your guests will be amazed at these yummy cake balls with a gooey center that looks like a oozing, bloody brain. 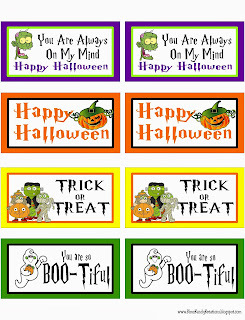 Add a free printable Halloween tag and you have the perfect treat. A few years ago, I discovered the most AAHH-mazing site for Halloween treats ever. I think when I found Beth's blog Hungry Happenings, I spent a good 3 hours reading every post and inviting myself to all of her holiday parties. Thanks to my husband's strong "No Stalking" policy, I haven't actually shown up at Beth's house yet, but everytime I read a new post, I feel like I'm there. So when she posted her great cake ball brains recipe, I knew I had to try it. I think I went and ordered the Brain Ice Cube Chocolate Tray Molds* from Amazon that very day, but of course, Amazon doesn't have same day delivery, and back then I wasn't smart enough to have Amazon prime, so I had to sit and wait. I ended up waiting a year. 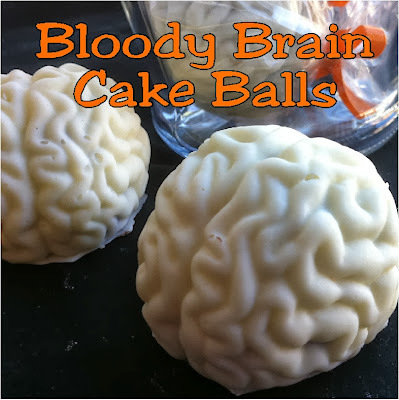 As Halloween rolled around and I started planning my Witch's Cupboard dessert table, I knew the Bleeding brain cake balls were going to show up at the party. You can find Beth's cake ball brains recipe here, but here are a few tips and tricks I figured out while making them. When I was trying to coat my Brain Ice Cube Chocolate Tray Molds* , I kept having the White Chocolate Melts* run down the sides and into the center of the brain. I ended up with a thin coating of chocolate on the sides and a thick coating in the center. I decided to wait a while and let my White Chocolate* thicken a little. It was much easier to coat the mold then. The chocolate stayed in place better. I used Smucker's Strawberry Flavored Topping* for my brain blood. I thought the strawberry flavor would go perfect with the chocolate cake flavor. Plus, the small pieces of strawberry in the sauce made it look like clotted blood a little. It just added another layer of "creepiness." I packaged my bleeding brains into individual sized 4x6 inch bags with orange and black bows on top. I'm hoping this will help each brain to stay a little fresher. By doing this and adding some cute Halloween tags, this would be a fun trunk or treat sweet to give all the trick or treaters in your neighborhood. 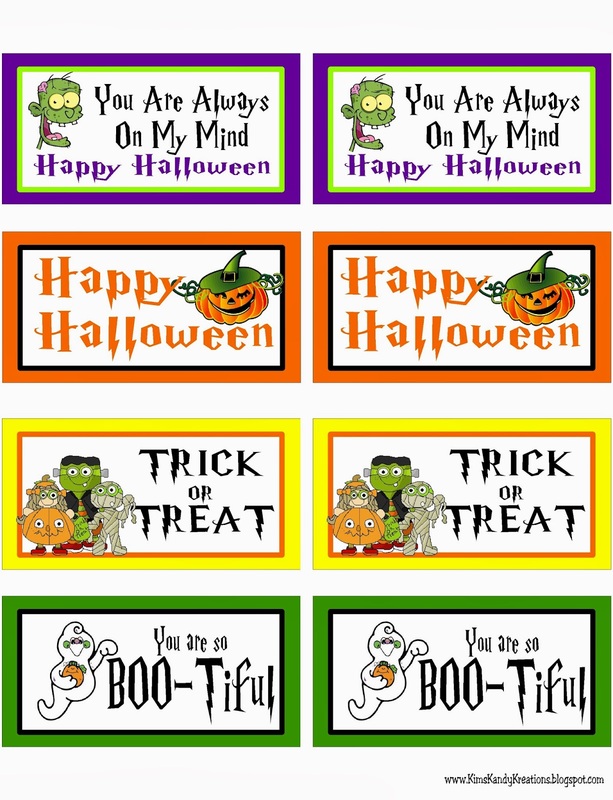 In fact, I like that idea so much, I had to create up a few Halloween tag printables that you can use to decorate your brain balls with. Good luck with your cake balls! I love Beth's site too! Oh. My. Gosh!!! These are SO AWESOME!!! Love this! Love these! They'd be awesome for Halloween treats. These are totally awesome! Thanks for sharing with us at our Thursday Favorite Things Blog Hop. I'm your newest follower via GFC. Can't wait to see what you make next. PS: come visit me if you have a chance. My kids are going to go ape over these! I'm your latest follower from the Thursday Favorite Things Blog Hop. Thanks for the tip about the chocolate I will make these for Halloween. Thanks everyone for the great comments! These have been a big hit and a yummy treat. Very gross, but in a good way! Thanks for linking up at our bloglovin' blog hop Kim! Best idea ever!! seriously. I wish our school allowed you to bring baked goods! If you have time, please link up at The Blog Strut! We Would love to have you! I think I love these more than the zombie fingers! Thanks so much for sharing this last week on Made in a Day! I have the molds ( brain, heart, etc) and love the recipe. I need to have an occasion to serve this.